Complimenti a Steinberg per i premi ricevuti alla Musikmesse di Francoforte! HAMBURG, Germany — March 24, 2014 — Steinberg Media Technologies GmbH celebrated a double award win at the Musikmesse trade show’s MIPA (Musikmesse International Press Award) awards night while receiving the readers’ choice award from the German Keys magazine the previous evening. The 15th MIPA saw more than 100 international magazines vote for the best musical instruments and audio equipment of 2013 and 2014 in over 40 categories. Nominated in three categories, Steinberg was honored with two awards, receiving their first MIPA of the night for HALion 5 in the category Software Instruments/Libraries. 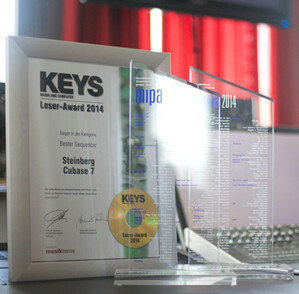 The second MIPA was given to Steinberg for Cubase versions 7 and 7.5 in the category Recording Software/Hardware. “It is a great honor to be acknowledged by the international press for the hard work we put into our software, and that two of our flagship audio applications, Cubase and HALion, stood out among the hundreds of entries from around the world, is exhilarating,” commented Stefan Trowbridge, PR manager at Steinberg. At the PPV Medien Reader Awards ceremony, Steinberg were presented with the readers’ choice award for Cubase 7 in the category Best Sequencer from Germany’s popular music and computer magazine, Keys. This entry was posted in Eventi, Hardware, Plug In, Samples Libraries, Software, Vst and tagged cubase, halion, musikmesse, steinberg. Bookmark the permalink.